Opened in heart of downtown in 1989, the Verne Riffe Center houses 3 theaters and a gallery, serving all areas of the arts. The sleek Capitol Theatre is a modern contrast to Columbus’ historic Ohio Theater. This state-of-the-art, 903-seat facility opened in 1989 as part of the Vern Riffe Center for Government and the Arts. The Capitol Theatre offers intimate performance experiences including CAPA's presentations of comedy, music, dance, theater, family entertainment, and cultural programming. The Riffe Center Theatre Complex includes 4 state-of-the-art theatres, scenery and costume shops, and offices. Also included in the Riffe Center Theatre Complex are 3 studio-style theatre spaces: Studio One, a 250-seat flexible space; Studio Two, an arena-style black box theatre; and Studio Three, a dance space/meeting room seating 100. In addition to the CAPA presentations, BalletMet, The Columbus Gay Men's Chorus, The Columbus Symphony Youth Orchestra, and Ohio State University Dance all perform regularly at the Capitol Theatre. The Vern Riffe Center for Government and the Arts Building was built in 1989 and designed by architects Bohm-NBBJ of Columbus. It is 33 stories tall and besides the theatres, it also houses the offices of the governor (when he is not using his offices located in the Capitol Building), lieutenant governor, members of the House of Representatives, and numerous departments of state government. Underneath the building are numerous tunnels connecting the building to the Huntington Center, Supreme Court building, and the Ohio Statehouse. 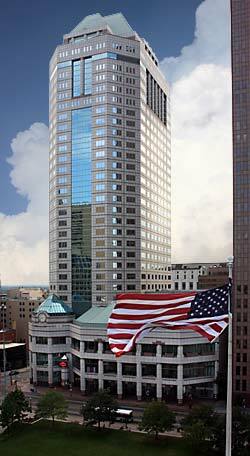 The center is named for Vernal G. Riffe Jr., a long-time democrat and Speaker of the Ohio House of Representatives. 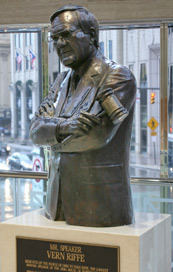 Riffe served as a member of the Ohio House for 36 years from 1959 to 1995 and was speaker of the house from 1975 to 1995. Verne Riffe was a dominant force in state politics for his 36 years in the Ohio House. He received numerous honors for his contributions to the state, including the Vernal Riffe Chair in the Political Science Department at The Ohio State University. He also has had several buildings named in his honor, including one at The Ohio State University, the Vern Riffe State Office Tower, home of the Ohio governor's office, in Columbus, and the Vern Riffe Center for the Arts at Shawnee State University.